If you’re currently pregnant or plan on becoming a parent in the near future, congratulations! Having a baby can be one of the biggest moments in a couple’s lives, and one that will require a lot of changes to be made. Every aspect of your life will change, including the dynamic of balancing your dog with your newborn. Your four-legged friend is most likely used to being the baby in your family dynamic, and the shifting of this family balance may lead to health and safety concerns for all involved. One way to optimize the outcome of growing your family is to enlist Cincinnati’s dog training experts for assistance. The Dog Wizard was founded to provide unbeatable services to our clients and their furry companions, ranging from dog obedience training classes to aggression work and more. Our certified, professional dog trainers have an amazing track record of success in training both pets and people in order to help everyone get the most out of their time together. While your dog enjoys spending time with you, he or she will need to learn to adapt to this shifting family dynamic. 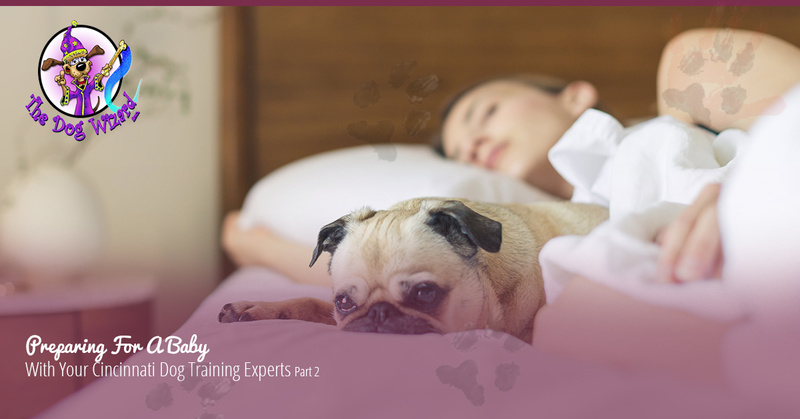 Today, we’ll continue to look into tidbits to help you prepare your dog for a newborn baby. When finished, be sure to contact us to learn more about our quality baby preparation classes! As hurtful as it may sound, it’s a good practice to begin reducing the amount of attention you give your canine on a daily basis. Many owners work out of guilt to supply their dog with a surplus of time and love, showering their furry child with attention until the baby comes. Once the baby is born, this high level of attention can drop off dramatically. Making a large change like this can create negative associations for your dog with the newborn. It’s best to begin lessening the amount of playtime spent with your dog a few weeks before the baby is due, gradually reducing your periods of play as time goes by. One thing that your dog will notice once baby is home is the bombardment of new sights and smells. It may prove beneficial to introduce new elements into your canine’s life, including audio elements. Sound. New parents have found great success when they experimented with playing recordings of babies in the home. Crying, fussing, and laughing are all sounds that your dog will hear over the years, but they may not initially be comfortable with the change. Smell is a strong part of any dog’s senses, and your canine’s nose will help in determining what is going on in your home. The introduction of a new baby can bring a host of new scents, creating the possibility that your dog will simply be overstimulated by all of the smells. Our dog trainers in Cincinnati have learned about the comfort that can come from preparing your pup in advance by bringing him or her lotions, powders, and other articles to smell and become familiar with. Once your new miracle is born, be sure to introduce an article of newborn clothing to your dog to allow them to become used to the scent. When your baby comes home, the dog should be alerted by a familiar fragrance instead of an invasive stench. Visual cues can also stress out your furry friend. We recommend setting up baby furniture and decorating the baby’s room in advance to give your dog time to acclimate to these major changes. Make sure you are positive and supportive of your furry child during this process, keeping a positive reinforcement to go with all of these new changes. While your dog may be the friendliest companion on the planet, it is always a good practice to focus on safety when introducing him or her to your new baby. Next time, we’ll look further into preparation tips that may help your canine in making the transition during this stressful process. The Dog Wizard is proud to be your go-to source for Cincinnati dog training, providing a versatile set of services to help owners and dogs of all types to work better together in order to more fully enjoy life’s adventures. Our dog training school places a high emphasis on providing a comprehensive approach to teaching your canine, utilizing the best aspects of several different schools of thought to provide a well-rounded program to give you both the tools needed to thrive. Contact us today to learn more or to enroll in one of our dog training classes!